I’m always excited to see LINK Dance Company’s May season because it’s the first opportunity to check out the latest crop of dancers selected to be part of the WAAPA Dance Department’s one-year pre-professional program. As the name suggests, LINK is designed to bridge the gap between tertiary training and the world of professional dance. A glance through LINK’s archives reveals that it’s been a springboard for many of WA’s current dancers and choreographers, including Co3’s Tanya Brown, Talitha Maslin, Antonio Rinaldi, Ella-Rose Trew and Zoe Wozniak, and independent dance artists Laura Boynes, Bernadette Lewis, Emma Fishwick and Isabella Stone, as well as the three members of Unkempt Dance (Carly Armstrong, Jessica Lewis, Amy Wiseman), just to name a handful. Welcome to the breeding ground. 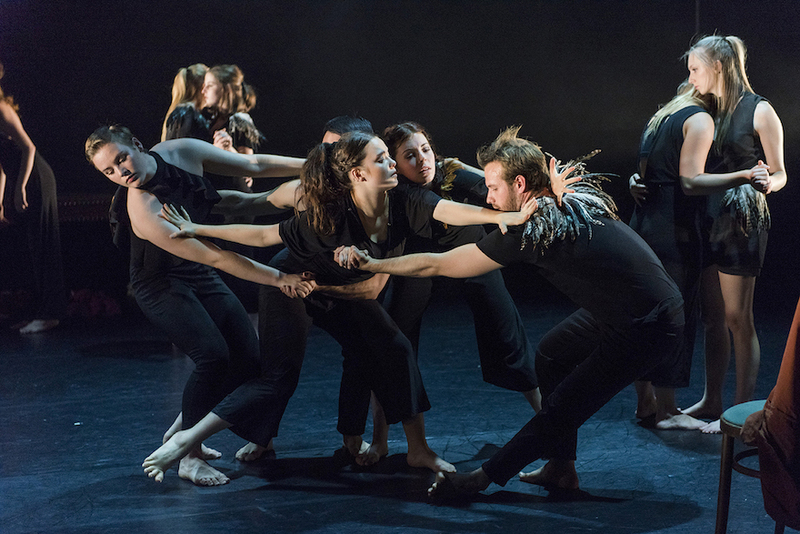 This year’s cohort of 15 emerging dance artists includes graduates from Adelaide College of the Arts (AC Arts), Queensland University of Technology and WAAPA, so it’s fitting that the first item on the “Differently Equal” programme, The Wedding, is a new work by 2009 AC Arts graduate Tobiah Booth-Remmers. A somewhat surreal experience, the work opens with a wedding scene that quickly morphs into chaos, as the guests collapse like dominoes, rolling across the stage as though caught in an invisible tsunami. Against Azariah Felton’s beat driven soundscape, pairs of dancers rail against one another. As layers of costume are peeled off one by one, the dancers’ movements become increasingly unrestrained, as though the layers of polite behaviour are being removed: Link Dance Company performing Tobiah Booth-Remmer’s ‘The Wedding’. Photo: Christophe Canato. As layers of costume are peeled off one by one – under long sombre-coloured coats are feather embellished black garments, and under those, black underwear – the dancers’ movements become increasingly unrestrained, as though the veneer of social niceties is being removed. The work was performed with wild abandon by the company members. After interval came The Wall – Several Illusions of the Wall by Chinese choreographer Xiao Xiang Rong, performed by 12 visiting students (unusually, with seven men to five women) from Beijing Normal University (BNU). The “Wall” in this work takes various formats. An actual wall houses a dancer, lodged amongst foam bricks. The dancers make walls of their bodies, their curved arms and legs mimicking the spaces of the now-collapsed foam brick wall. Dancers standing shoulder to shoulder become a human barricade against a powerless individual. In muted blues and greens, the 12 young performers from BNU were lithe and athletic, frequently moving as a well-rehearsed whole. Photo: Christophe Canato. In muted blues and greens, the 12 young performers were lithe and athletic, frequently moving as a well-rehearsed whole through turns with arms held as if in surrender, or deep hinges with legs akimbo. The final scene has a strange and mournful beauty as dancers’ hands emerge, plant-like, through the crevices of the foam bricks, to contemporary, almost ghostly, strings and vocals. 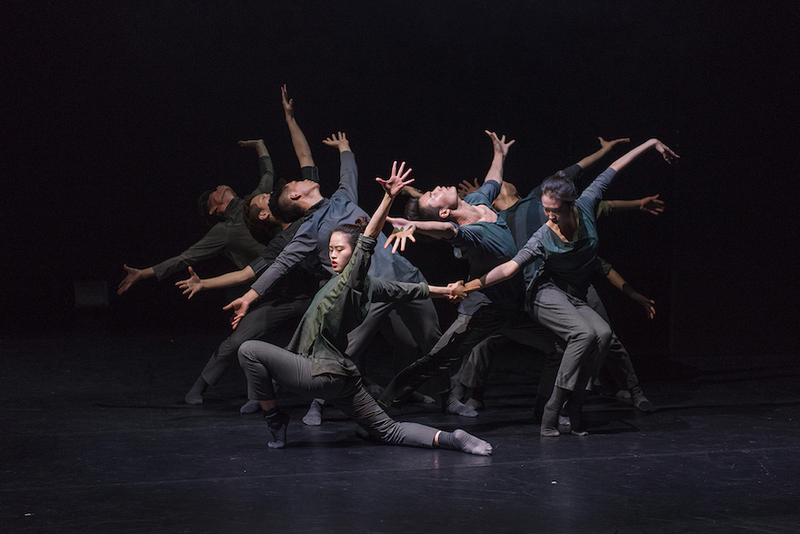 The LINK dancers returned to the stage for the final work, Mangos, earrings and a glimpse of hope, by New York-based, Israeli choreographer Ori Flomin. Created for this season, it’s whimsical piece with an eye-catching opening. A carefully placed strip of light adds both drama and humour to the first scene as the supine dancers’ body parts poke, often comically, into the luminous light-shaft. Flomin ups the silliness factor in the next scenes. With the dancers changed from cream coloured onesies into street clothes with a zany edge (think outsize sunglasses, shiny fabrics, pops of colour), the next section sees ballet, tap, jazz, character crammed together what seems like a playful montage/homage to the suburban dance school (if you see the show, keep an eye out for the flamboyant Jessie Camilleri Seeber here). Finally, it’s every dancer for themselves, in a kind of fruit-themed therapy session. “Differently Equal” provides an engaging introduction to the new LINKers, and their guests from BNU. Kudos, too, to composer Azariah Felton, lighting designer Matthew Marshall and set and costume designer Rozina Suliman, whose creations for the two LINK works mark them as emerging talents in their respective fields. “Differently Equal” plays the Geoff Gibbs Theatre until 25 May. Pictured top: A playful montage/homage to the suburban dance school: LINK Dance Company performing Ori Flomin’s “Mangos, earrings and a glimpse of hope”. Photo: Christophe Canato.